The Washington Area Parrot Head Club was created to promote friendships and organize social activities for people with similar interests, including enjoyment of the tropical spirit of Jimmy Buffett’s music. In the process of making new friends and having fun, we believe in leaving something positive behind. We are a non-profit organization which provides a variety of volunteer efforts in the local, regional and national community for social and environmental causes. Our club is open to anyone with the tropical spirit and desire to contribute to the betterment of our community. 1. The name of this organization shall be Washington Area Parrot Head Club (hereinafter, "WAPHC" or "the Club"). 2. WAPHC was incorporated as Washington Area Parrot Head Club, inc., a Virginia non-stock corporation, in the Commonwealth of Virginia on August 9, 2001. 3. WAPHC is a sanctioned member club of Parrot Heads In Paradise, Inc., an Arizona Corporation (hereinafter, "PHIP"). 4. This Constitution shall govern the business and administration of WAPHC. Nothing contained herein shall supercede, nor should be perceived as superceding, the Bylaws of PHIP. 5. WAPHC and PHIP maintain no legal affiliation. PHIP and/or its officers will not be held liable or accountable for the actions or behavior of WAPHC or any of its members. 6. In the event of dissolution, officers shall donate all assets remaining after the payment of all bills, legal expenses and other financial obligations to a charity or charities previously supported by the Club. 1. The Membership shall consist of all Members in Good Standing. 2. New Members shall be afforded the right to be recognized for attendance and participation in all club activities, contribute to the determination of operating, social and service agendas of the club, and may also vote on business matters brought before the Membership, unless specified otherwise within the Charter or Bylaws. 3. Full Members shall be afforded the rights of New Members with the addition of the following (except where otherwise noted): nominate or second a nomination of another Full Member for election to the Board, be nominated and elected to office, subject to the requirements of Section 4.2, vote in an election through any allowable channel, and vote on revisions of the Charter or Bylaws. 4. In the event of a lapse in membership lasting for a period of 6 months or more, any member is welcome to rejoin the club. These members will be afforded the same rights as the New Members. Full Member rights will be reinstated on the 91st day. 5. Any member of the Club may be terminated with just cause by a two-thirds vote of the entire Membership. Any member of the club may file a written complaint against another member to the Board. If the majority of the Board finds validity in the complaint, the accused will then receive written notice of the complaint from the Board within 14 days, sent via verifiable means. The accused will be given an opportunity to respond within 30 days of receipt. An expulsion vote will be taken from the Membership at the next General or Special Business Meeting. The accused, the plaintiff, and any other member or officer shall have the right to address the Membership in this meeting. A vote will then be taken by secret ballot and tabulated by the Secretary or other designee of the presiding officer at this meeting. 6. Any member who has been previously terminated from the club can only be reinstated with New Membership status upon approval from a two-thirds vote of the entire membership. A petition must be filed by a Full Member on behalf of the member previously terminated from the club. If the Board determines that a member should be allowed to rejoin the club, it will announce to the membership that a vote will be taken at the next General or Special Business Meeting. 1. The Club will be directed by an Executive Board (hereinafter "the Board") of officers elected by the Full Members of the WAPHC. Officers of the Club shall be President, Vice President, Secretary, Treasurer, and Director of Membership. The immediate Past President may elect to participate in Board Meetings as a non-voting member. 2. Club officers shall serve without compensation. Expenses incurred by officers in carrying out assigned administrative duties of the Club shall be reimbursed upon presentation of sufficient documentation to the Treasurer and approval by the Board. All reimbursements made to officers will be documented by the Treasurer and available for review within 10 calendar days upon written request. 3. Specific duties of the President shall be to: a) when present, serve as the official club representative at meetings, events and community activities; b) preside over meetings; c) approve and file reports in a timely manner to assure that the Club remains in compliance with the requirements of PHIP; d) release, or approve the release of, official communications to the Club and to outside organizations; e) call and schedule meetings, and f) establish ad-hoc committees as necessary. 4. Specific duties of the Vice President shall be to: a) fulfill any or all duties of the President if he/she is unable or incapable of doing so; b) ascend to the office of President in the event that the President resigns or is removed from office; c) advise and assist the President as necessary; d) evaluate development and community service opportunities consistent with the objectives of the Club and PHIP. 5. Specific duties of the Secretary shall be to: a) record minutes of all Business Meetings and all meetings of the Board; b) prepare all required reports for PHIP and other entities as needed; c) distribute copies of minutes and reports to members and the Board upon request and approval of the Board; d) designate a member to take minutes at any meeting that he/she will be unable to attend, and e) collect and tabulate the votes on all issues other than officer elections. 6. Specific duties of the Treasurer shall be to: a) serve as the fiscal officer of the Club; b) open and/or maintain all checking accounts in the name of the Club; c) maintain accurate income and expense records for the Club in a medium acceptable to the Membership and the Board; d) furnish records and prepare periodic reports for General Business Meetings and as mandated by the Board; e) develop budgets for the club’s annual operations and for special projects as called for by the Board; f) filing federal and state tax returns when necessary, and g) filing annual reports to the State Corporation Commission when necessary. 7. Specific duties of the Director of Membership shall be to: a) keep accurate records of the membership roster for the needs and requirements of PHIP and the Board in a format acceptable to the Board; b) keep accurate records of attendance and participation in club activities as defined in the Bylaws; c) provide an accurate list of candidates eligible to serve on the Board prior to elections; d) develop and recommend to the Board a membership development strategy consistent with ideals of the Club and PHIP, and e) make records available to the Board and to others authorized by the President or the Board. 8. General duties of the Board shall be to: a) plan, execute and recommend to the Membership a schedule of social and service activities consistent with the mission statement of the Club and PHIP; b) announce and publicize meeting times and locations; c) communicate all pertinent information to the Membership; d) oversee the progress of committees toward accomplishing their goals and charges, e) keep historical and current records of the Club; f) review the annual budget and financial statements; g) consider any changes in membership dues prior to the beginning of each calendar year; h) designate appropriate ad-hoc substitutes for absent Board members. b. The remaining members of the Board will notify the named officer of receipt of a complaint within fifteen (15) days. c. The President (or, if the President is the named officer in the complaint, the Vice President) shall call a special meeting of the Board to review the complaint. The named officer shall be given the opportunity to present his/her defense at this meeting, as shall the accusing member. The Board will then review the evidence presented and vote in closed session to retain or recommend removal to the Membership. A majority or tie vote by the remaining officers to recommend removal will result in forwarding of the case to the Membership. d. If the Board recommends removal of an officer, the President (or, if the President is the named officer in the complaint, the Vice President) will schedule and preside over a vote of the Membership at the next General Business Meeting or at a Special Business Meeting to be held within 30 days of the Board decision. Both the member filing the complaint and the officer in question will be permitted ample and equal time to speak to the Membership before being excused from the meeting. Discussion then shall be conducted with the Board and Membership. A vote will then be taken by secret ballot of all Full Members and tabulated by the Secretary or other designee of the presiding officer. Receive written nominations for each office from qualified members for one week prior to the Special Business Meeting. Call for, announce and close nominations for officers at the Special Business Meeting. Request and compile acceptance notices from nominated candidates for each office, review the qualifications of nominees in accordance with this Charter, and announce the slate of all qualified nominees no later than 1 week following the Special Business Meeting. Once the slate of qualified nominations is announced, there will be no further consideration of additional candidates for the election, precludes “write-in candidates”; During the election of officers process, if any officer position is uncontested. The nominee for the uncontested position is therefore elected by unanimous consent and no ballot vote is required for the uncontested position. .
Solicit general questions for the candidates from the Membership for a period of one week following the announcement of the slate of qualified nominees and deliver all questions to the candidates. The Sergeant-at-Arms will make answers available to the Membership for review one week prior to the Election Meeting. 1. Distribute, collect and tabulate all ballots. 2. Write in votes for individuals will not be tabulated. 3. Select at least 2 neutral parties to assist with vote tabulation and verification. 4. Provide an address to a secured location for eligible voting members to send physical ballots. In addition, determine required guidelines for submitting all votes cast prior to the election meeting which should include but is not limited to postal and electronic means. 5. Have all ballots available at the time of voting. During the election process, all official communication related to candidates will be delivered to and by the Sergeant-at-Arms. All candidates will be expected to maintain fair and honest campaign practices according to the Rules of Election which are defined in the Bylaws. 2. An Officer must, at the time of election and through the term of office, be a Member in Good Standing. Each officer candidate must have been a Member in Good Standing for the full calendar year prior to that which he/she is being elected to serve. Within the last 3 years, the President Elect must have also served on the Board, or been a committee chair. 3. Starting with the election of 2014 the Vice President, Secretary and Director of Membership will be elected for 1 year terms of office, and for the 2015 election, President and Treasurer will be elected to 1 year terms of office. Starting with the 2016 election and every year after that, the term of office for all officers will be 1 year. 4. If a vacancy occurs among the elected officers of the Board, the presiding officer shall within seven calendar days give notice to the Membership of same in a manner consistent with the Club’s official communication. If a vacancy occurs in the office of President, the Vice President shall ascend to the office of President for the remainder of that President’s term. If a vacancy occurs in any other office(s), the remaining members of the Board shall appoint a Sergeant-at-Arms and call for a Special Election to fill the vacated office(s), in a manner consistent with Sections 4.1 and 4.2. A current officer on the Board may be elected to fill another vacancy on the Board and vacate an office. Special elections will then be held at this meeting until all offices are filled. A General Business Meeting shall be called and held each quarter, at a time and location announced by the Board, and within the Club’s PHIP designated boundaries. 1. The Club shall operate on a Fiscal year from January 1 through December 31 of each year. 2. All monies of the Club shall be received by the Treasurer and deposited in a Federally-insured bank account in the name of the Club. 3. The President, Vice President, Secretary and Treasurer shall be authorized signors for disbursements from Club funds. All disbursements must be authorized by no less than two officers, neither of which can be the originator of the disbursement request. All disbursements in excess of $100 must be authorized in advance by the Board. 4. Any contract or legal document that obligates the Club in any manner is to be approved in advance by the Board. 5. Only Board Members shall be authorized to sign contracts or legal documents on behalf of the club. 1. WAPHC neither approves of nor assumes responsibility for actions by members which may result in deliberate injury to persons or damage to property. 2. No club member, officer or entity of the Club is authorized to contact HK Management or Margaritaville, Inc., its successors and/or assigns, regarding promotional materials provided by said organizations to PHIP, or any other matter pertaining thereto. 3. WAPHC prohibits discrimination by any member or component entity on the basis of race, national origin, gender, religion, handicap, sexual orientation or marital status. It is a policy of the club to foster a spirit of universal acceptance among all peoples. 1. Proposed amendments to these Bylaws must be presented in writing to the presiding officer at a regularly called General Business Meeting. After discussion, the proposed amendment will be tabled for a maximum of 45 days. Within this timeframe, a Special Business Meeting will be called. The Board will, no less than once week prior to the Special Business Meeting, communicate the proposed amendment to all Members in Good Standing. Voting will be limited to Full Members. Should a Full Member be unable to attend the meeting, he/she shall be given the opportunity to vote on said amendment as an absentee so long as record of his/her vote is delivered to the Secretary, at least 48 hours prior to the meeting. At the Special Business Meeting the presiding officer will call the amendment open for discussion. Once a vote is called and taken, all records of present and absentee votes shall be furnished to the Secretary for tallying. If two-thirds of all votes cast are favorable, the proposed amendment shall be adopted, and become effective upon the conclusion of the meeting. 2. 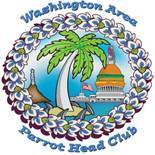 This Charter of the Washington Area Parrot Head Club was adopted by the club on January 16, 2008. The Board shall within 30 days of the beginning of each calendar year appoint at least one Chairperson (but not more than two) for each committee, and designate one Officer to each committee to serve as a committee member. Chairpersons serve at the discretion of the Board. 2. Chairmanships are open to all interested and qualified members. Therefore, the notice of available Chairmanships shall be open for a period of time no less than 10 calendar days to ensure that all members who are qualified and interested in participating are given a fair opportunity to do so. Committee chairpersons will form their designated committees from the pool of Members in Good Standing. Chairpersons for both Standing Committees and Ad-Hoc Committees will be required to present quarterly activity reports in sufficient detail to support the required semi-annual PHIP report and recommendations at the General Business Meeting. Committee chairpersons shall report suggested FINS allocation for their activities to the Director of Membership within 14 days of the activity. 3. The Events Committee shall be responsible for examining all proposals related to proposed social events, recommending a schedule of activities to the Board and the Membership, and carrying out the planning of all Club events. 4. The Charity Committee shall be responsible for exploring and recommending to the Membership service projects worthy to pursue, and service organizations worthy to support in connection with the purposes and mission of PHIP and the Club. The Committee shall also direct the planning and participation of the Club in charitable events and projects approved by the Board. 5. The Communications Committee shall be responsible for exploring and recommending to the Board and the Membership new sources to promote the welfare, activities and ideals of the Club, carrying out all publicity for Club events and the Club’s participation in social activities, producing a Club Newsletter when recommended by the Board, and collecting material for the Club’s website. 6. The Membership Committee shall be responsible for distributing a schedule of Club events and activities to those members who do not have access to electronic communication, recommending and implementing programs for the benefit of the Membership, and assisting the Board with directing membership development activities. 7. The Finance Committee shall be responsible for assisting the Board and the Treasurer with implementing fundraising programs, and evaluating recommendations to strengthen the Club’s fiscal policies and objectives. 1. The Washington Area Parrot Head Club and its officers are committed to providing a broad activity schedule. The officers will strive to present a diverse schedule of activities and events to appeal to members. 2. Due to the numerous opportunities to participate in service and social events that the Club and the officers will be presented with, there will be occasions where the Club will not be able to commit its official participation. Participation and attendance in such events may be promoted by the Club, but members will not be rewarded with FINS. The Board will make and have the final decision as to whether an event will be classified as official by the Club. a. Sponsored: WAPHC organizes, establishes, advertises and runs an event. b. Co-sponsored: WAPHC joins with another club, charity, or business to promote and participate in an event; the officers will ensure that all rules responsibilities dictated in the organizer’s or primary sponsor’s contract are presented to the Membership. c. Administration: WAPHC is invited to assist with the organization and administration of an event, and granted the right to publicize this participation. d. Participation: WAPHC is invited to participate in an event as a Club and display signs with permission of the event organizer. 4. The Club’s official participation in an activity may also be determined by whether it is located within our geographic area of service. The Club’s service area shall be the greater Washington, D.C. Metropolitan Area. This does not preclude the Club from engaging in events or trips outside of our service area, so long as they do not directly affect, conflict with or compete with another sanctioned club’s activities. 5. The Club’s official participation in an event may also be determined by additional factors, including the timeliness of its announcement, its consistency with the Club’s mission statement, and the presence of a conflict with another Club activity. 1. Participation in the Club shall be open to individuals who pay their membership dues for the calendar year beginning January 1, in the amount to be determined by the Board. Membership dues are Non-Tax Deductible. 2. An individual may join the club at any time upon payment of membership dues for that year. Only upon payment will an individual’s participation in Club activities and/or attendance at Club events be recorded. 3. Members in Good Standing will be awarded FINS based on attendance at and/or participation in official Club functions. Committee Chairpersons and Activity / Event Leaders will be responsible for recommending to the Director of Membership the award of FINS, based on attendance and/or participation, using the guidelines in section 11.5.c. The Board shall be responsible for approving and recording all FINS allocations and administering the award of scarce resources that may be provided to the Club from time to time. 4. Unless otherwise authorized by the Executive Board, FINS and any resource privileges earned therefrom are not transferable among members or transferable to a non-member. a. Upon notification and receipt of allocations to the Club of scarce resources or invitations, members will be given the opportunity, based on the accumulation of FINS, to claim the scarce resource until all members are given this opportunity. If any scarce resources then remain available after reasonable time passes, members will be given the opportunity, again based on the accumulation of FINS, to acquire additional scarce resources. This process shall continue until the supply of scarce resources allocated to the Club is exhausted. Additional FINS may be rewarded upon recognition of special merit by the Board. Officers are not eligible for FINS for participating on their assigned committees, but are eligible for FINS for participating on any other committee. c. A member may not receive participation points for both serving on a committee and leading a committee if it is the same committee in both instances. If a fee is required for a member to participate in a Charitable Activity, they will also be awarded participation points for “contributing to a club charity”. A member may receive a duplicate allocation for attending and working an Event or Social. d. FINS awarded to members will be updated on a monthly basis and posted for the entire Membership. 6. The awarding of scarce resources will be determined by the number of FINS earned by each member over the previous 12 months from the date the Board is notified of available scarce resources. a. Addressing the General Membership in regard to the candidates through the organization’s distribution list is prohibited unless all candidates are granted the same privilege. b. Offering money or gifts for votes is prohibited. c. Personal attacks of another candidate are prohibited. 2. Any member with just cause can report misconduct to the Sergeant-at-Arms. In the event that a candidate is charged with violating the above or committing other unfair practices, the Sergeant-at-Arms will perform due diligence to determine if the charge has merit. In the event that the charge is determined to have merit, the Sergeant-at-Arms will co-ordinate a group of 5 neutral members who are not current candidates. This group will unanimously determine if the charge is valid, and if the severity of the incident is such that the individual be removed from the election process. 3. Once the Sergeant-at-Arms has been selected, no standing board member may use the organization’s distribution list to address the General Membership on any issue related to the candidates, or any issue related to the election process that has not been previously communicated by the Sergeant-at-Arms. 1. Proposed amendments to these bylaws must be presented in writing to the presiding officer at a regularly called General Business Meeting. After discussion, the proposed amendment will be tabled for a maximum of 45 days. Within this timeframe, a Special Business Meeting will be called. The Board will, no less than once week prior to the Special Business Meeting, communicate the proposed amendment to all members. Voting will be limited to Full Members. Should a Full Member be unable to attend the meeting, he/she shall be given the opportunity to vote on said amendment as an absentee so long as record of his/her vote is delivered to the Secretary, at least 48 hours prior to the meeting. At the Special Business Meeting the presiding officer will call the amendment open for discussion. Once a vote is called and taken, all records of present and absentee votes shall be furnished to the Secretary for tallying. If a simple majority of all votes cast are favorable, the proposed amendment shall be adopted, and become effective upon the conclusion of the meeting. 2. These By-Laws of the Washington Area Parrot Head Club were adopted by the Club on July 16, 2014. Charitable Activity - A club function that occurs once over a given period of time requiring that members volunteers their time to benefit non-profit or otherwise charitable organizations. In some instances, an entry fee may be required, but there is no monetary benefit to the club. Charity Drive – A collection of goods or money by the club to be donated to a specific charity. Charity drives may be ongoing, such as a clothing collection or singular such as a Thanksgiving turkey drive. Event - Any club function requiring that attendees purchase a ticket for entry. Examples of this would be the 4th of July party, the rooftop party, New Year’s Eve, or trips to a ballgame. FINS - FINS are participation points granted to members in good standing and tracked by the Director of Membership. Point levels are identified in section 11.5 of the WAPHC Bylaws. FINS have no monetary value and are used for the purpose of determining the allocation of any scarce resources. Full Member – A full member is defined as a member in good standing who has been so for 90 consecutive days or more. General Business Meeting – General Business Meetings are defined as meetings of the General Membership on a quarterly basis that must minimally include a financial report. Immediate Past President - The immediate past president is defined as the individual who held the office during the preceding term, providing the individual is a member in good standing. Member in Good Standing – A member in good standing is defined as an individual who is current on their chapter annual dues and is a minimum age of 21. New Member - A new member is defined as any person who has not previously been affiliated with the WAPHC, and has been a member in good standing for less than 90 days. Scarce Resources – Scarce resources are identified by the Board and are defined as any commodity of limited quantity which would be in high demand to the club members. Social - any club function where there is no cost for attendance and there is no defined connection to a Charitable Activity or Drive (though these may take place at or in concurrence with a social). Special Business Meetings – Any meeting of the General Membership called outside of the General Business Meetings. Written Request - Written request refers to any communication sent either through regular postal mail, a company in business for the purpose of delivering mail, or through e-mail. **Under Article 3.2, written request is defined as: to the current recognized Treasurer through e-mail, or postal mail, with copies to the board.